Transform your corner of the world into a better place to come home to. You deserve it! Find out how simple it can be for Aqua-Tech to transform your backyard into an enjoyable, inviting and rejuvenated space. Get the inspiration you’ve been looking for! A full backyard makeover will have a transformative impact on your property and how much you enjoy it. From a simple swimming pool refurbishment, new decking and the addition of easy to maintain landscaping to a full-scale pool upgrade complete with a hot tub installation, customized outdoor kitchen and integrated landscaping, our talented team will create, construct, install and oversee every aspect of the design. Let Aqua-Tech’s experienced renovation team create a beautiful harmony of water, sight, and sound. If you’re choosing a full backyard makeover because you’ve just bought a new home, your property needs some work or now’s the time to give your family the backyard they deserve, we’ll elevate your space to your own private oasis. All of the work will be undertaken by our own in-house team, who work closely with you, ensuring the most seamless process possible and preventing the delays that can happen when multiple companies work together on one project. The major renovation project as well as an equipment purchase and installation over the past 8 years have left me 100% satisfied! From the initial meeting, to planning, computer generated designs, execution and completion, we take a complex job and make it simple and enjoyable. We are dedicated to helping our customers realize their dreams. Don’t wait any longer to get the backyard you’ve always wanted. Call today and begin planning your full backyard makeover! Get Your FREE Custom Renovation Quote! Take the first step towards a swimming pool and backyard you can fall in love with again! Your swimming pool and backyard renovation quote includes all costs—and never any surprises. 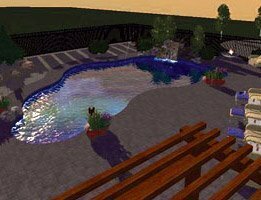 Get a 3D Design of Your New Backyard! We use the most accurate and sophisticated 3D modelling software available to offer you a clear picture of how your new swimming pool will look in your backyard. You'll see the proportion of the features and more!